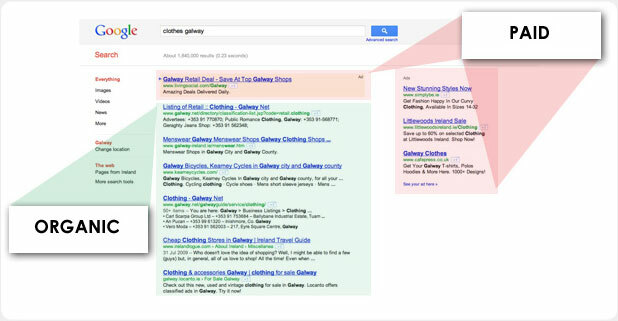 Organic and paid listings both appear on a search engine when someone types in a specific search query (keyword or phrase). To appear high up in the organic listings you need to optimise your website for search through search engine optimisation or SEO. To appear in the paid links requires a PPC campaign. Search engines clearly differentiate between natural (organic) and paid listings by displaying the results on different parts of the page. An effective search engine optimisation SEO strategy can provide your business with a prominent position in search results. In order for this to have the greatest benefit for your business it is important to build your search engine activities around the keywords and search queries that are most relevant to your business. There are over 694,000 searches conducted every second on Google – how many of those could be potential customers? It is important to see your website as a shop window and to make the most of it to get found on-line and attract new customers to your business by implementing an effective search engine optimisation strategy. How can EzSales benefit your business? At EzSales we are sales and marketing professionals so appearing high up in the search engine rankings is not our only focus. Once we optimise your website for search so it appears in the search results for relevant search queries, we want the customer to visit your website over all the others. How do we do this? We use our sales and marketing expertise to select the most effective marketing messages – this is the start of the process of turning browsers into buyers.